The first partners’ meeting and the official launch of the Facing all the Facts project took place in the beginning of December. The two year-long project aims to generate more efficient responses to hate crimes and hate speech at national level and beyond. Watch the video of the Press conference held in Brussels at Google's premises. Published on November 16th , the 2015 ODIHR hate crime report highlights an under-reporting of bias motivations and gaps in reporting across countries. CEJI – A Jewish Contribution to an Inclusive Europe is delighted to announce it has received a substantial amount from the European Commission Directorate General Justice - Fundamental rights and Union citizenship.These funds will support the new project “Facing all the Facts”. 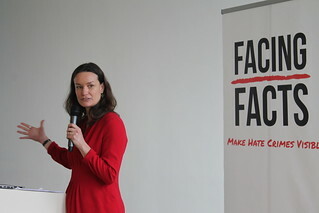 Building on the success of the past four years, Facing Facts!, the innovative programme aiming to tackle the issue of hate crime in Europe, hosted the Facing Facts Forward Conference in Brussels on March 3rd and 4th 2015. Read the conference report and recommendations. View a selection of photographs from our recent 'Facing Facts! Foward' European Conference held in Brussels in March.